The FLIR Breach Thermal Monocular, P/N PTQ136 is built for the rigors of law enforcement. The FLIR Breach PTQ136 spots the heat of suspects and objects in total darkness. 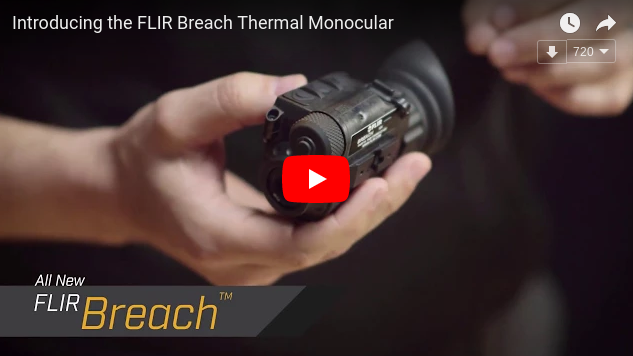 Featuring the new FLIR Boson core and a compact design, the FLIR Breach offers unmatched tactical awareness. Weighing only 7.4 ounces (210 grams), the FLIR Breach can be concealed in a pocket or mounted to a helmet with its mini-rail feature, while adding minimal weight to officers’ heavy gear. Additional features include on board recording and seven palettes for fast detection of suspects or evidence, day or night. Document operations with on-board video recording and image capture. Choose from multiple palettes to perfect viewing during varied situations. Enhance situational awareness with a digital compass/inclinometer. Configures Operational Settings: Unit On/ Off, Display Brightness Control, Image Palette Control, Digital Zoom Control, On-Screen Menu Navigation, NUC.